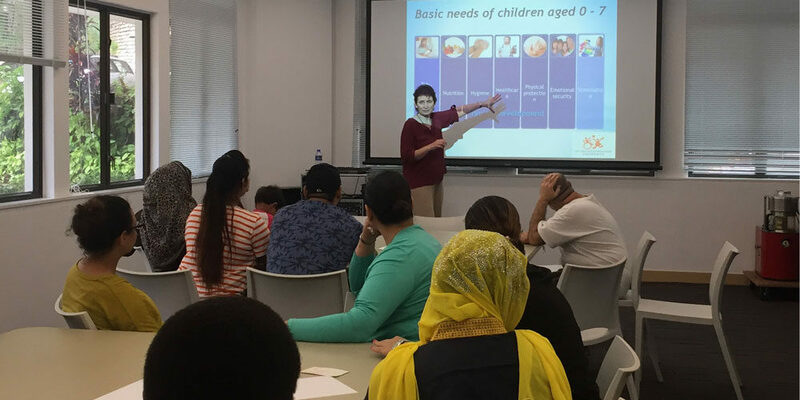 With the generous support from the Ohel Leah Synagogue Charity (OLSC), the Child Development Centre (CDC) has been able to continually offer the Early Child Development (ECD) Screening Outreach Programme to underprivileged families. In 2017/18, the CDC successfully organised 15 sessions of the screening outreach programme for 99 children and 137 parents, in order to raise parent’s awareness and knowledge of the importance of the early childhood years. In Hong Kong, the developmental needs of young children are sometimes neglected due to economic pressures, busy lifestyles or a lack of parental knowledge. Some parents simply do not know their children are in need of intervention or have misconceptions. Therefore, since 2012, the CDC has offered a cross-agency service by collaborating with community partners in educating parents about the importance of early identification and intervention of non-typical development during early childhood and in screening young children to identify those at risk. The Screening programme is offered in English and Cantonese and delivered in 2 parts, a parent talk which highlights critical factors in the development of children aged 0 to 8 years; and a screening of children 7 years and under to identify any red flags in their development. In 2017/18, we successfully offered ECD Screenings to 99 children and identified approximately 32% of screened children for further comprehensive assessments or to commence therapy to address their developmental needs as highlighted in the screening result. The success of the programme provides timely training for the child with individual needs which is crucial for their growth. We are looking to further develop our community services through this and other projects. For further details, please contact us at info@cdchk.org.